I've only included two models for the sake of kineme bandwidth. 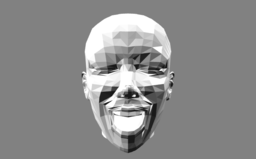 This does a morph between two objects of the same structure size, using the OpenCL kernel. Recently I had made myself a "mesh to particle" comp and now with this one can morph between two meshes. I attached the comp! In my example .qtz a human is morphed into a skull. I published some of the particles parameters to play with. Sweet piece of work. Must look into this to see if one can morph between two dynamic meshes of same member number. What does dynamic mesh mean... one that's being warped? Yep... as long as structure count is the same, this lerps between. So, if you had something that wasn't equal count (like two totally different models), you could possibly structure range the one with the greater amount of vertices, but the entirety of the model with the greater vert/normal count may not render of course.